WARNING: This is a preview of Good Help. All components and rules are prototype and subject to change. If you love board builder and survival card games, make room in your game collection for Good Help: The Card Game. It is important to read the entire rule booklet before setup and gameplay begin. 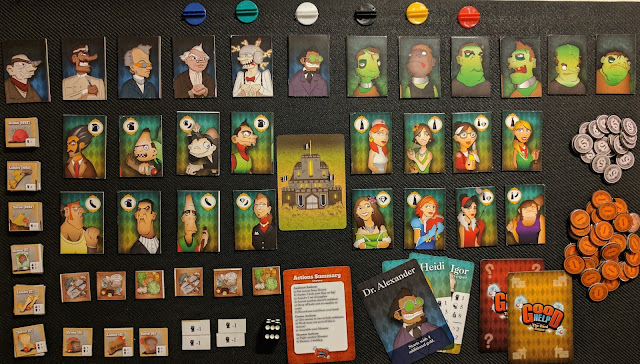 The rules go in depth about the roles of Doctors, Assistants, and Monsters as well as what a typical turn looks like. There are many exceptions or loopholes to the rules. I recommend looking up anything you are unsure about as you play, so keep that rule book handy! This game follows a science fiction theme as assistants fight amongst each other, grave rob, and steal body parts for the Doctor’s monster. Gameplay also explores what lengths each assistant is really willing to go as some have restriction text: Thomas (a male assistant) won’t confront redheads. 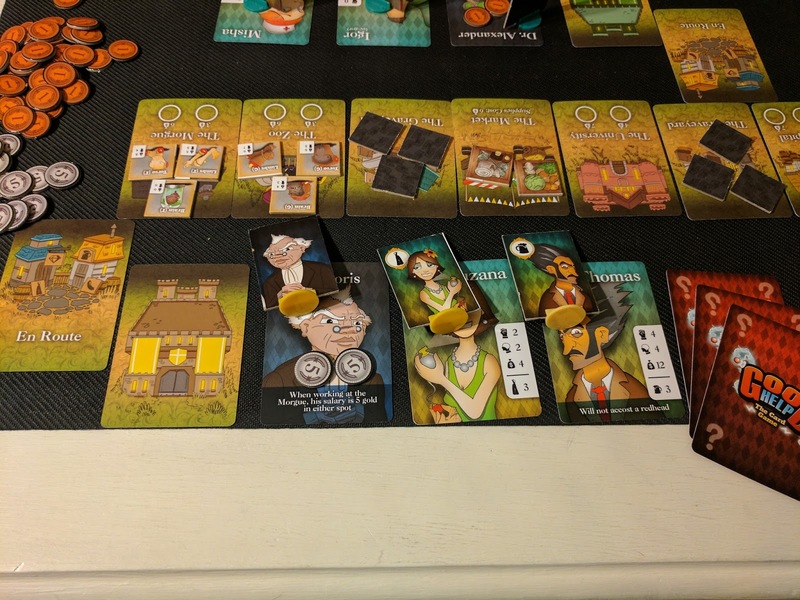 The mechanics of the game feel complicated during the first few playthroughs, but become easier to remember and perform with time. Having the list of which characters (doctor, male assistant, female assistant) can do which actions is necessary for the first several games. Each game of Good Help will be different. The combinations of different assistants, Doctors, and items allow for fresh gameplay every time. The objective of the players during the game can be broken down into two categories: gathering supplies, and monster rampage. In the first, the assistants top priorities are to collect the highest strength body parts they can find as fast as possible. The Doctor’s work is to find the highest paying job possible to make money for buying body parts, and passing this cash off to his assistants. Doctors can also serve as bodyguards as most assistants will not confront each other in the presence of their own Doctor. Once all body parts, supplies, and necessary cash to pay off assistants is in the castle objective two, the monster rampage, begins as your monster is created. The only movable token for the player is now their monster, who can either destroy buildings in the town or fight other monsters. If you are the last monster standing or have destroyed four buildings in the town you are the winner. The game gives an age range of 12+ which I think is accurate for this game. While the theme is very appealing for children younger than 12, the complicated rules and interactions between characters would be extremely challenging for them. You will never see another board game like it! The objectives, theme, and gameplay are all unique and fun. It would make for a fight-free family game night, as large age range of players can all enjoy the theme of the game and playing against each other. The rules left several holes in basic game play, this could be frustrating for first time players. Also, the first game takes an extremely long time due to all the rule checking and house rule creation. I loved the concept of this game, and was thrilled to see the gameplay lived up to its sci-fi horror promises. Revision of the rules on in depth turn actions as well as basic rules and setup are needed to provide more clarity. Dungeon builders like Boss Monster or other board-builders like Betrayal at House on the Hill will love Good Help. I am giving Good Help: The Card Game 6 out of 10 super meeples.